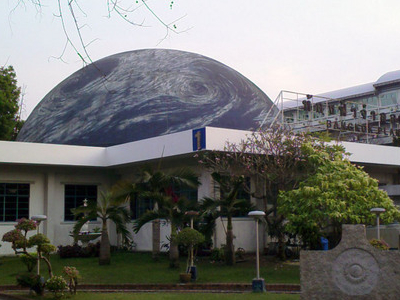 The Bangkok Planetarium is the oldest planetarium in Thailand. It is located on Sukhumvit Road in Bangkok as part of the Science Center For Education, which is operated by the Department of Non-Formal Education of the Ministry of Education. Construction of the planetarium began in 1962 with a budget of twelve million baht and the planetarium opened on 18 August 1964. The planetarium dome is 20.60 metres in diameter and 13 metres high, and holds 450 seats. The planetarium utilizes a Mark IV Zeiss projector, which was the first instalment of a large planetarium projector in Southeast Asia. Apart from the theatre itself, the planetarium building also features permanent exhibitions on astronomy, aimed for young audiences. Shows are held four times daily, except on Mondays, at 10:00, 11:00, 13:30 and 14:30. On weekdays, the 10:00 and 13:30 shows are reserved for school students. Admission is 10 baht for children and 20 baht for adults. Here's the our members favorite photos of "Planetariums in Bangkok". Upload your photo of Bangkok Planetarium!